I came across his short stories through a review request and have been a dedicated fan ever since. All his life, Rodney “Red” Daley loved building bombs. Now, however, this retired weapons expert is in an assisted living home. Forced to play Bingo and checkers all day, Red attempts a daring escape. It’s no use. But then Red gets his hands on some wires, and a battery, and a timing device…. 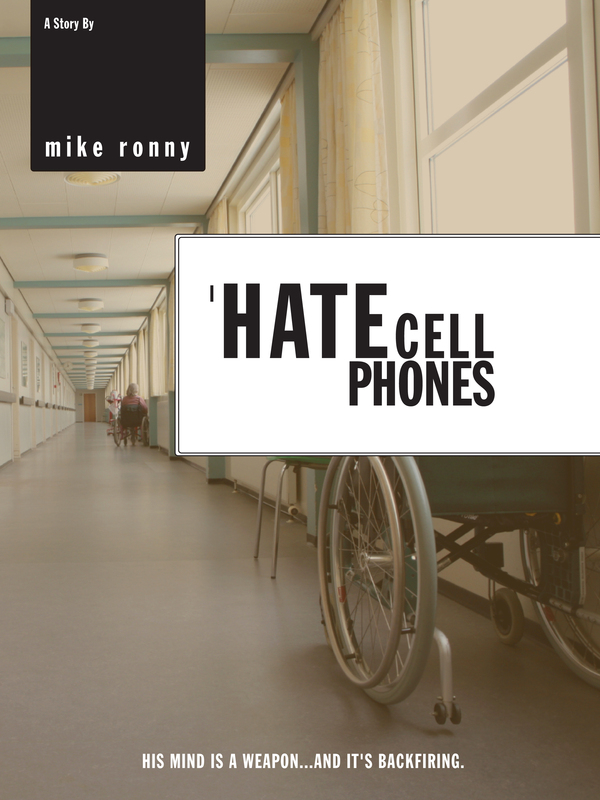 “I hate cell phones” is a bitter sweet short story told from the perspective of an ageing man, Red, who is reluctant to accept the reality and consequences of his progressing dementia. Although he is stubborn, odd and difficult we get to like him regardless for his honesty and we feel with him as the decisions on his life are being made for him. It is an amazing achievement to pack so much depth and thought provoking material into so few pages. As far as the portrayal of the ‘patient’ is concerned the format of a short story is sufficient. The short snapshot of his life gives us enough insights to ponder about. I warmed to Red as a character so much that I was a little disappointed when the story ended. I could have done with a lot more episodes during which our hero battles with his increasingly more difficult environment. Ronney’s use of language is simplistic, competent and skilful; the flow of words is natural and smooth. A writer to watch. I ate up this short story within an hour! I Hate Cell Phones had me laughing out loud at some points, and smiling sadly at others. The narrative line follows Rodney (“Red”) who suffers from dementia and is put into an assisted living home at the insistence of his son, Billy. The story was short, but in that short amount of time, I felt that I came to know Red pretty well and understand what he was going through. Red is one of the most entertaining characters I think I’ve ever come across. His crass don’t-give-a-crap attitude made me laugh quite a lot when I read this, and the way he interacts with all the other residents at the assisted living home warranted a chuckle or two. One scene that I adored was the checkers scene with Winslow where they start shooting checkers across the room instead of playing the game. 🙂 I thought that was adorably entertaining. The author’s style is very authentic in this work, and it honestly felt like I was listening to Red tell me the story in person. The dialect he uses reminds me of my own grandfather and the way he used to speak, so the authenticity made this even more real to me. It’s sort of sad to watch Red forget where he is and why he’s there, but that element is what makes this story so unique. I just wanted to try writing a genre detective story, and hopefully to make readers laugh along the way. For some reason, whenever I thought about creating a mystery, I imagined a detective who had no idea what he was doing. It’s a comedy-mystery. I posted a version of this story on Amazon last year, but I took it down and I’m revising the piece now to emphasize the comedic aspects. I don’t want to duck any questions, but I can’t see my stories as movies. If anyone ever did want to make a film out of one of them, however, I’d be thrilled with any actors. I’d be happy if they used puppets. Roddy Danvers, a lazy senior at a small Vermont college, finds his English professor’s body and decides to investigate the murder, believing that if he catches the killer the school will give him extra credit. Self-published; I don’t see an agency in my future! It’s hard to determine because I write in fits and starts, and sometimes I’ll work with story ideas I came up with years before. Having said that, a first draft usually takes me a few weeks to write. It’s not a book, but the closest work to this story I can think of, starting with the title, is Woody Allen’s 1993 film Manhattan Murder Mystery. I’m not comparing myself to Woody Allen, but that movie also revolves around first-time amateur detectives, and it’s filled to the brim with jokes. I’ve long enjoyed the mysteries of Agatha Christie and Arthur Conan Doyle. The idea of setting up my own mystery, with tiny clues pointing to the killer and other material designed to throw readers off the trail, was irresistible. I’d say that, unlike most of the stories I write – stories which make some attempt to affect readers’ emotions – “College Murder Mystery” is just for fun. I’ll return to that other kind of story after this one. He sound like just the kind of writer I love to read. Thanks for this review and interview!